Linda has this ability to challenge me every now and then. She goes wild with ideas and then puts me on the list of do-able. While I still think it is not possible or I could not do it. She already has the faith that I could and can do it. So here is to conquering new challenges. To trying out new fields in photography. As you might have noticed sport photography is not exactly my field. But let me tell you, I´m beyond happy I had the chance to give it a try. So this time was not only sportive but sportive with swords. Linda is training to become a marshal arts instructor and I´m glad to be part of this journey and watch her pushing her own limits. I love how we extend the limits of our own imagination. So this is as close to an answer to that old question. I enjoy the month May... enjoy scribbling it on every page I turn, enjoy the days growing longer and the herbs on the balcony growing with each rain, enjoy the golden light extending night after night and enjoy the first grilling on the balcony, enjoy the first day to wear my new mint (of course) maxi skirt, enjoy the first afternoon to sit on the porch with a good friend with ice cubes in the glasses and ... ahhh, you know, spring. Even if I fancy myself having packed a pretty perfect handbag for this Saturday's wedding... I still find some things missing. You would think there is some kind of routine or predictability when you photograph weddings on a regular basis... but still there are new things coming my way every.single.time. For example this one... I was just about to overcome my fear of heights once more, while taking a picture on what felt like the 8th balcony of the church. Let me just tell you it was a freakin' high church... And I lean over the balustrade to grab this one overview shot as my knee brushes against an old church bench. This second I was thinking to myself how very stupid it would be to hurt my knee and get a splinter. Sorry if it was to detailed. I was grateful I did not feel a thing. Yes this is the wedding-day-adrenalin talking. So here I wish you a sweet new Monday with a sneak peek from this most gorgeous wedding of Sarina & Tim. Can´t wait to share more. They met in the country of her forefathers. She was in Rome to study and while it was clear to her that she did not want to stay in the eternal city much longer she was determined to make something else last forever. Her friendship with the man of her dreams. To our greatest delight we had the honor to witness Sara & Hicham tying the knot on a chilly march Saturday, in a small circle of warmhearted dear ones in the city center of Stuttgart. 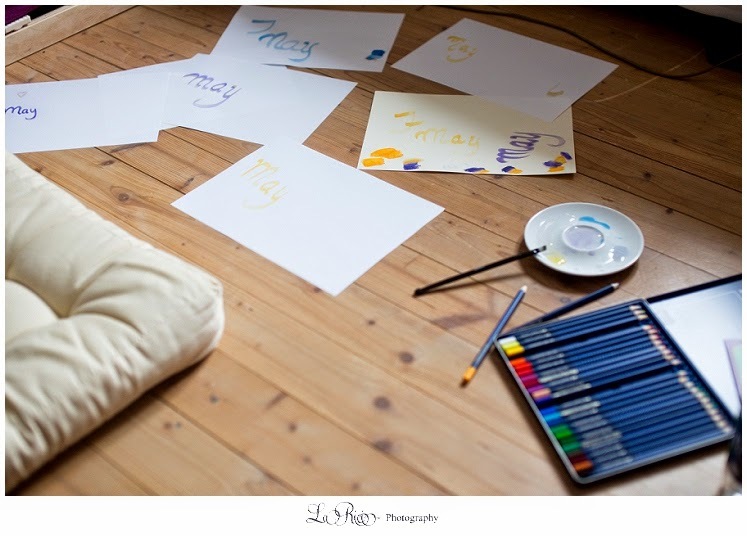 Dear Sara & Hicham, Thank you for facing the cold and stormy breeze and for taking this lovely time for the portraits. We had a blast capturing you! Lei viene dalla Germania, lui da Marocco, la lingua comune è l’Italiano. Lei andava a Roma per studiare, e dopo poco sapeva che non voleva rimanere nella città eterna per sempre. Però alla fine ha trovata l’amore eterna lì. Abbiamo avuto l’onore di fotografare Sara & Hicham e loro giorno specialissimo nel centro di Stoccarda. 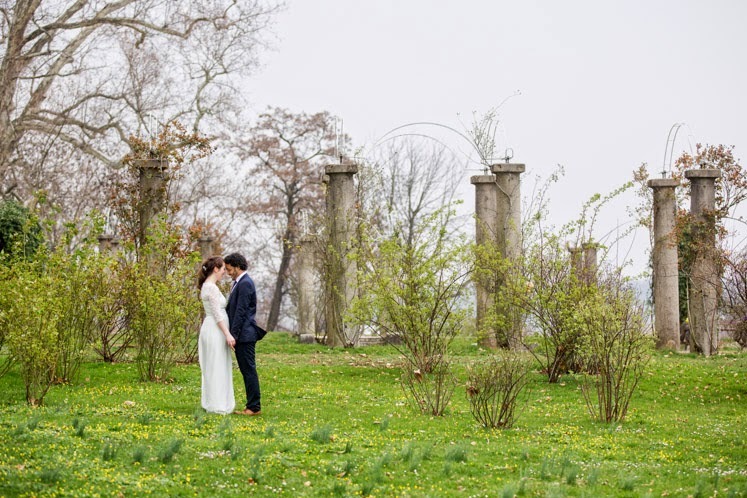 Il matrimonio è stato festeggiato un freddo sabato di Marzo in un cerchio di amici molti affettuosi. Cara Sara, caro Hicham, grazie per queste ore bellissime, è stato una gioia avere voi due davanti al nostro obbiettivo. Vi auguriamo tanta, tantissima fortuna! My father cracked up as I sent him the obligatory outrage whatsapp message. Late at night, the opposite direction... I tried to avoid killing little frogs on my way home as I was also fighting a huge amount of mist on the street. I was driving some kind of evasive manoeuvre around these little guys which are not hopping but slow motioning, stretching one arm in the air and then just wait ... The first time I crushed one I winced for like 10 minutes. As the first lighting stroke the area I thought about having yet another speeding ticket waiting for me... it felt like a universal warning... then I realized it was just a lightning ;) Driving home in a huge thunder Storm freaked me out a bit ( a lot). Also that Saturday I performed my first solo wedding of 2014, without dripping into a guest, bride or pool... Nor falling of a fire truck. Speaking of fire trucks... yes you read that right! Sometimes on wedding days weird things happen... and then you have the choice to roll with it, or run. As someone suggested it would be best to take the group picture from the fire truck... well... I did not run. I just said, let me put on some pants. 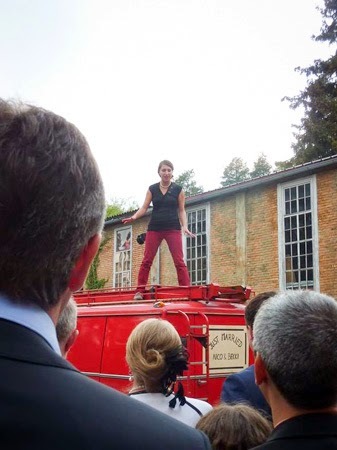 I honestly did not want to climb a vintage fire truck in front of two-hundred guests in my LBD (little black dress). In a twisted kind of way taking a group image while standing on a vintage fire truck was a personal highlight. Since things like that never occurred to me, it was never on my list. I´m so glad I neither dripped nor fell of that precious thing, while giving directions to the crowd. Thank you dear for capturing this!